A Bob's Life: Who is on our Money? The debate about whose face graces our money rages and I have heard some irrational and just wrong statements. Presidents and Founding Father's have not always been and are not the only people on our money! Our money has seen generals, mythical gods and goddesses, inventors, famous people, and others. Salmon P. Chase is on the $10,000 bill right now! Who is Salmon P. Chase and why is he on our money, even if the $10,000 is not in general circulation? Martha Washington has been on the $1 bill twice. Susan B. Anthony is on the $1 coin. Sacagawea is also on $1 coins. Mercury (yes, the Roman god) has been on dimes! Liberty (the goddess) has been on dollar coins. Indian likenesses have graced both pennies and nickels. 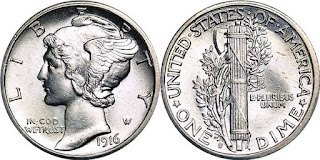 In addition, the Wright Brothers, Ceasar Rodney, Helen Keller, and John Muir have been on quarters. On currency, 53 individuals have been depicted. You might be surprised about who they are. Who is Running Antelope? He was once on the $5 bill. General George H. Thomas was on the $5 during the 1890's. It is amazing how different reality is from common perceptions! Sinks--why did it have be a sink? They Tell Stories . . .